And so, this Ring, a co-production between the Aix Festival and the Salzburg Easter Festival, has reached its conclusion. I have not seen the Rheingold yet, but have seen Die Walküre on DVD and Siegfried in the theatre. As with those previous dramas, the greatest signal achievement proved to be that of the Berlin Philharmonic Orchestra. Luxury casting seems something of an understatement when one hears so virtuosic an orchestra in the pit. There were very occasional slips, almost inevitable from the horns, but barely a handful, which really only served to remind one that these were human beings – not such a bad thing when it comes to Wagner’s tale of the twilight of the gods. There remains a degree of loss in terms of ‘old German’ orchestral sound: Karajan’s work is perhaps now more than complete. However, if one takes the internationalisation of the Berlin orchestra as a given, there were aspects of this performance that bade fair to create new standards for technical excellence. I have certainly never heard the low brass play with such dramatic force in those passages later in the first act and during the second, in which Wagner creates sounds of instrumental and harmonic ugliness wholly new, and yet entirely necessary for his drama. The trombones and Wagner tubas had to be heard to be believed. Hagen’s call to the vassals and their response registered as truly terrifying, on the basis of the voice of Wagner’ orchestral Greek chorus, at least as important in this respect as that of the excellent actual chorus. Sir Simon Rattle continued his good work in the pit. Again, I had the impression that his interpretation would deepen with further immersion in the score, but there could be no doubt that he had the measure of its structural import and its orchestral detail. Even the BPO cannot play Göttterdämmerung by itself. Wagner conductors whom we rightly praise to the skies, for instance Hans Knappertsbusch, could often prove surprisingly casual with matters of colour, but not Rattle. His experience and that of his orchestra in French music – take the previous night’s Ravel and Boulez, concucted by Boulez himself, or Rattle’s own recent L’Enfant et les sortilèges – is put to excellent use in back-projection of a sometimes undervalued aspect of Wagner’s compositional legacy. My only real reservation was an occasional tendency to press too hard, not so much in terms of tempo, although there were one or two instances of that, as of orchestral sound. There were, especially during the first act, just a few instances of a brutalisation of sound that did not always tally with dramatic purpose. 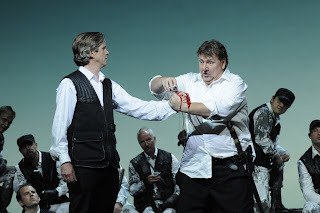 This was reminiscent not so much of Karajan’s Wagner – the Ring in particular often exhibited a chamber-like delicacy under the Austrian conductor’s baton – as some of his 1970s Beethoven. I am at a loss when it comes to Braunschweig’s production. There is nothing to which one could, with reason, vehemently object, but nor could I discern any insights, let alone revelations. According to a programme interview, what Braunschweig ‘likes’ in Götterdämmerung is that here, following ‘the development of great philosophical and psychological’ questions in the preceding dramas, ‘one returns to a more trivial level, to an almost bourgeois drama.’ It is a point of view, I suppose: not entirely unrelated to George Bernard Shaw’s writing off the Ring’s final drama as succumbing to the love panacea, and perhaps not entirely unrelated to the parallels with Ibsen some commentators have discovered. Yet, wrongheaded though I might have thought Braunschweig’s almost complete disavowal of Wagner’s political for the director’s – and to a certain extent Wagner’s – psychoanalytical concerns earlier in the cycle, it might have been more rewarding to have carried the latter through into the final instalment. It was now not at all clear why the characters, despite some very strong individual performances, notably those of Petrenko and Dalayman, should be of any greater significance. If Götterdämmerung takes place on a relatively ‘trivial level,’ then I hardly dare think what might qualify as profound, as world-historical. 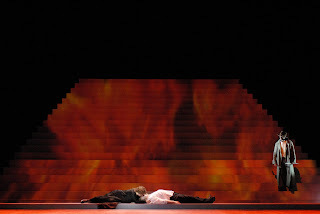 Even Alberich’s re-appearance to observe, Wanderer-like, the Immolation Scene – to start with, I thought he might be Wotan, though I have no idea whether the resemblance were deliberate – somehow seemed shorn of significance. Perhaps this nihilism was the ultimate in Wagner domesticated. For, whereas what I had previously seen had led me to wonder whether this might turn out to be a culmination inspired by Robert Donington, it now seemed nihilist, not in a sense that Nietzsche would have understood, but simply because the ideas had run out. Even in its own terms, the production did not seem to have the Ibsen-like quality at which Braunschewig appeared to hint in the quoted programme note. Attention-seeking touches such as a final, apparently ‘amusing’ bobbing up from the Rhine of the Rhinemaidens, seemed just that. I have no especial regrets at a lack of staging for Siegfried’s Rhine Journey, but I could not help suspecting that the fall of the curtain suggested lack of interest rather than a positive decision. If it were not for the stylishly minimalist sets – yet to what end? – or the technically accomplished, if oddly reticent video projection of the Rhine in the opening scene of the third act, it is difficult to imagine what would have been lost in a concert performance. Considered almost as such, however, there was a great deal to praise.